Vancouver, BC - Skyharbour Resources Ltd. (TSX-V: SYH) (OTC Grey: SYHBF) (Frankfurt: SC1N) (the “Company”) is pleased to provide an update on the Preston Uranium Property (the “Property”) being explored by the Western Athabasca Syndicate (the “Syndicate”). 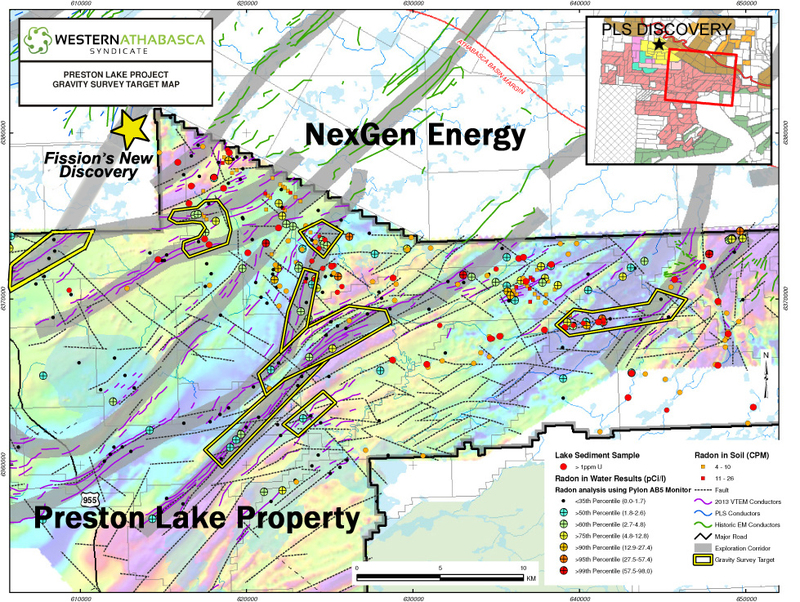 The Preston Property is strategically located proximal to Fission Uranium’s expanding, high grade Patterson Lake South (“PLS”) discovery as well as NexGen Energy’s Arrow discovery. The Syndicate recently engaged Peridot Geoscience Ltd. to complete an advanced analysis on the extensive airborne geophysical datasets at the Preston Property. The analysis has successfully confirmed existing high-priority targets at the property as well as identifying several other new target areas. The Syndicate continues to employ a systematic, proven and cost-efficient exploration methodology that has led to numerous uranium discoveries in the region and throughout the Athabasca Basin. The Syndicate is in the process of planning a field program at the Preston Property for early 2015 that would consist of diamond drilling lake-based and land-based high-priority targets, as well as geophysical and geochemical surveys to further refine targets and identify new targets. Drill testing of the various target areas is being prioritized including drilling at previously undrilled targets that will be accessible when freeze-up occurs later this year. Earlier this year the Syndicate reported highly encouraging results from a first-pass diamond drill program at Preston consisting of nine holes which confirmed the presence of widespread alteration, structural disruption and radioactivity that are typically associated with uranium deposits in the Athabasca Basin. The three initial drill target areas, out of a growing target base currently standing at fifteen, were selected by the Syndicate’s Technical Committee for drilling based on encouraging fieldwork results and coincident anomalies. The majority of uranium targets on the Property have not yet received any drill exploration. The Syndicate has carried out one of the largest regional exploration programs in the relatively underexplored western side of the Athabasca Basin over the last fifteen months. A total of approx. $3.75 million in expenditures on the Preston Uranium Property has been incurred including ground gravity, airborne and ground EM and magnetics, radon, soil, silt, biogeochem, lake sediment, and geological mapping surveys, as well as boulder prospecting and a first pass diamond drill program. Fifteen high-priority drill target areas associated with eight prospective exploration corridors have been successfully delineated through this methodical, multi-phased exploration initiative which has culminated in an extensive, proprietary geological database for the project area. 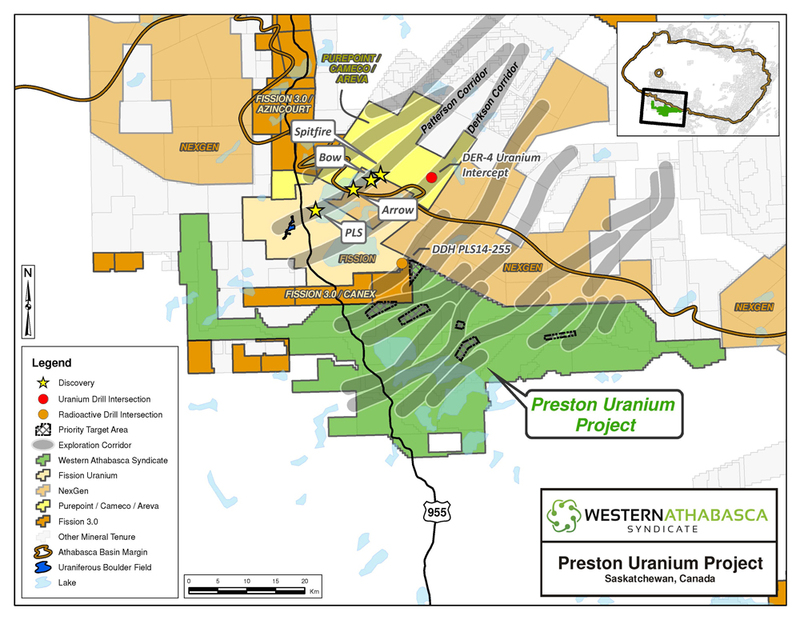 The 246,643 hectare Preston Uranium Property is the largest individual property proximal to Fission Uranium’s Patterson Lake South high-grade uranium discovery and the recent discovery made by NexGen Energy on the Rook-1 Project. The Syndicate is the largest land tenure holder in the southwest Athabasca Basin region including properties strategically situated to the southwest and to the northeast of the PLS and NexGen discoveries. Approx. $3,750,000 dollars in exploration has been carried out to date by the Syndicate on the Preston property and many priority targets remain for further follow up with both fieldwork and drill testing. The spot uranium price has moved up to $41.75/lb according to UxC which is an increase of almost 50% since the lows of $28/lb this summer. This recent price appreciation has been driven by utilities, traders and financial entities entering the market, suggesting that this rally could have some sustainability. Furthermore, the Kagoshima Governor in Japan, Yuichiro Ito, has approved the restart of two nuclear reactors at Sendai. The announcement marks the final step before the first Japanese nuclear reactors restart next year following regulators on-site checks. Skyharbour Resources Ltd. is a uranium exploration company and the operator of the Western Athabasca Syndicate which controls a large, geologically prospective land package consisting of five properties (287,130 hectares or 709,513 acres) in the Athabasca Basin of Saskatchewan. Approx. $3,750,000 of the planned $6,000,000 in combined exploration expenditures over a two year period has been invested in the properties thus far, the bulk of which is being funded by the three partner companies. Skyharbour also owns a 100% interest in the Way Lake Uranium project on the east side of the Basin which hosts an NI 43-101 compliant inferred resource totaling 7.0 million pounds of U3O8 at 0.03% and 5.3 million pounds of ThO2 at 0.023%. Skyharbour owns a 60% interest in the Mann Lake Uranium project on the east side of the Basin strategically located 25 km southwest of Cameco’s McArthur River Mine. The Company has 57 million shares outstanding with insiders owning over 20% of the outstanding shares. Skyharbour’s goal is to maximize shareholder value through new mineral discoveries, committed long-term partnerships, and the advancement of exploration projects in geopolitically favourable jurisdictions.